Dermatitis herpetiformis is a skin rash from celiac disease which can be properly managed by following a gluten free diet. Dermatitis herpetiformis (DH) is a skin rash which resembles herpes lesions which can appear as blisters and bumps but it is not a form of herpes. Nearly 15 to 25 percent of celiac disease suffers who do not show digestive issues will experience DH. Dh is often seem more so in men than women and can affect any one at any age. John Zone, MD, CDF Medical Advisory Board Member and Chairman of the Department of Dermatology at the University of Utah School of Medicine explained, “When a person with celiac disease consumes gluten, the mucosal immune system in the intestine responds by producing a type of antibody called immunoglobulin A (IgA).” IgA enters the bloodstream and collects in small blood vessels under the skin triggering further immune response which causes the blisters and bumps. Dermatitis herpetiformis is seen in those who have celiac disease and even though the name suggests the herpes virus, that virus does not play a role in DH. Celiac disease is an allergy to gluten – a protein found in many grains. Dermatitis herpetiformis is caused as a reaction to gluten as the body creates antibodies – IgA – to attack gluten it can also enter the bloodstream and collect underneath the skin. White blood cells begin to attack the antibodies and so they release a chemical called “complement” which leads to the itchy, blistering rash. The main risk factor for dermatitis herpetiformis is having celiac disease. Celiac disease has been found to run in families and so if you have family members with celiac disease your risk of the illness goes up as well. 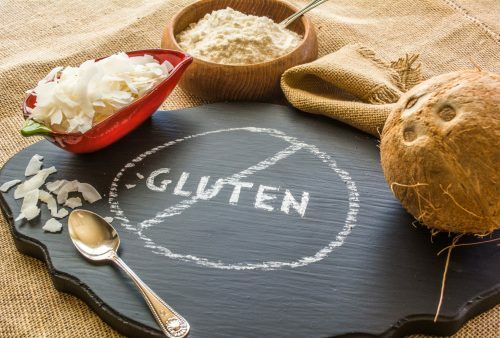 Celiac disease is an allergy to gluten and so in order to properly manage symptoms and reduce flare-ups, a strict gluten free diet is recommended. Furthermore, even if a person doesn’t have intestinal symptoms it is still wise to follow a gluten free diet in order to manage dermatitis herpetiformis. When a person who has celiac disease consumes gluten it can cause intestinal damage as antibodies strip away the areas of the intestines which are responsible for the absorption of nutrients. When a celiac patient avoids gluten not only are they protecting their intestines in the long-run but they are also preventing flare-ups of DH. Even though the rash from DH is temporary it can still be a nuisance as it can be extremely itchy and so taking necessary steps to prevent the rash from developing can save you the irritation. Luckily with the rise of celiac and gluten awareness following a gluten free diet is easier than offer. Many foods indicate on their packaging if they contain gluten or not as well as restaurants are getting into the practice of having gluten free options on their menus. With the help of you doctor you can better understand which foods are safe to eat and which should be avoided in order to better manage DH. Dermatitis herpetiformis is diagnosed through a skin biopsy where a small skin sample is analyzed under a microscope. Another useful test is known as direct immunofluorescence where dye is added to the skin which reveals IgA antibody deposits. Blood tests, too, can help reveal antibody levels in the blood and help diagnose DH. Dermatitis herpetiformis can be treated with antibiotics but there are side effects which can occur such as liver problems, light sensitivity, anemia, muscles weakness and peripheral neuropathy. Not only will a gluten free diet benefit dermatitis herpetiformis but it can help with celiac disease as well.